Thieves essential oil blend was inspired by the legend of four 15th-century French thieves, who formulated a special aromatic blend composed of clove, rosemary, and other botanicals to use while robbing the dead and dying. Thieves blend combines pure Clove, Cinnamon Bark, Rosemary, Lemon, and Eucalyptus essential oils and has been university tested for its cleansing properties. Thieves Household Cleaner is an all-purpose, concentrated cleaner formulated with 100 percent plant- and mineral-based ingredients. Thieves Household Cleaner is biodegradable and complies with EPA standards. 2. Add 2-3 Tbsp to the bottom of an empty foaming handsoap dispenser. 4. Add 1/2 tsp of vegetable glycerin or a few drops of vitamin E oil (optional). 5. Fill with filtered water, slowly. 6. Shake gently to combine. Pump a couple of times to get the foaming started. 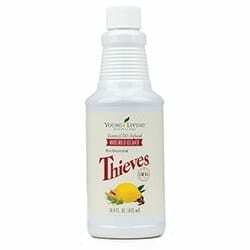 In your clean bottle add the Thieves essential oil. Next, add witch hazel. then pour distilled water into bottle until full. Put on the spray top and use. Dissolve super washing soda in water in glass or stainless steel bowl. Add the rest of the ingredients and mix well. Funnel into an empty dosh soap bottle. Add 1/2 capful of Thieves Household Cleaner for extra cleaning power. Mix ingredients together and store in mason jar. For use on showers, tubs, sinks and toilets. Mix in spray bottle, spray surfaces and wipe clean. Mix together. Add a sachet of white rice to container to absorb mixture. Use 2 Tbsp per load. Mix ingredients to make a paste. Add 10 drops of your favorite essential oil. Apply to interior of microwave, sink, toilet, tub, or shower. Scrub and rinse. Fill your choice of fruits or veggies in a large bowl and place in the kitchen sink. Combine ingredients and pour over produce. Wash and rinse. Combine ingredients in a glass container with lid. Use 1 Tbsp per load. Use vinegar and 2-3 drops of lemon essential oil as your rinsing add. Combine in a bottle and mix well. Add 1 to 2 tablespoons of the mixture to your dish water. Add vinegar and Lemon to water. Dip clean dishes in water/vinegar/Lemon rinse. Stir grated soap into boiling water until melted. Add washing soda and salt. Stir until dissolved and add 6 qts of water, stirring until well mixed. When cool add Thieves Cleaner and essential oil and stir. Pour into cleaned empty laundry bottles or other container. Makes over 6 quarts. Combine and funnel into an empty bottle. Shake before each use and pour into fabric softener dispenser or softener ball. Make fabric softener sheets for the dryer with this recipe too! Simply cut up old t-shirts, put them in a container with a lid and pour this mixture over the cloths to saturate. Store with lid on. Throw a wet cloth into the dryer with your clothes. Mix together and store in a mason jar. Add 1/8-1/4 cup of the mixture to your washing machine. Add 10 drops lavender, lemon, melaleuca, Purification, Citrus Fresh or favorite EO to a dampened washcloth. Toss the dampened washcloth into the dryer to impart a lovely fragrance on the clothes. Store in a colored glass container (photo sensitive). I like to reuse my Perrier water bottles for this. Mix together by shaking the bottle. Mix together, pour onto Bounty Quilted Napkins in a seal-able container. Let the napkins absorb the liquid. Combine above ingredients into 6 oz. spray bottle, shake well, spray mattresses and allow to air dry. Put in spray bottle and shake well. Shake well before using. In an empty container combine these ingredients and sprinkle 2 Tbsp into kitty litter when cleaning box daily. Mix together in a 12 oz. spray bottle. Shake well before each use. Use on toilets, tubs, sinks, counter tops & walls, wipe clean with a dry, soft cloth or rag. Combine the above ingredients in a small container to make a paste (add more baking soda if necessary). Test a small spot first for possible surface scratching. With a soft brush or scrub cloth, clean desired surface. Rinse with water or clean wet cloth to remove residue, finish with soft dry cloth. Intended for single, same day use. Want more recipes to create a healthy and healing home? 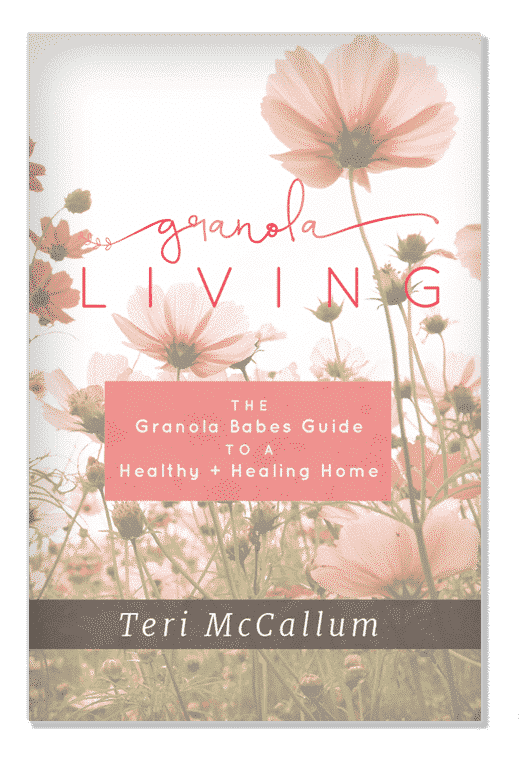 The Granola Living book is the resource for anyone wanting to eliminate toxins and chemicals from their home. This book provides over 100 recipes for every area of your home, including blends for room sprays, roller bottles, diffusers, and bath salts and scrubs. Order your copy today!